OUR PRICE: $20.83 - Join Rewards Get $2 Dance Dollars On This Item! The "Pro Elastic" by Bloch features a canvas upper with an elastic piece that replaces the binding and drawstring. The elastic contours the foot in a full range of movement, and evenly distributes tension around the foot relieving pressure on the Achilles tendon. Pre-sewn crossed instep elastics. I really love these canvas shoes. They fit nicely and compliment the shape of my foot. They are not the most durable, however, last a reasonable amount of time given the frequency of use. I would highly recommend them! Just what I need in a basic comfortable dance shoe, and great for my WIDE feet! Hugs the foot nicely, no give when you point. Shows the foot nicely. These run large. I wear a 7.5 street shoe and needed size 4. I do wear my shoes very snug. They look great thru the toe but the heel seems a little squared off and sticks out a little and doesn’t conform to my heal. My daughter has been wearing this shoe since they first came out with them. According to her they form to the foot quite well and look great. Because they are made to hug the foot closely you might think that they feel too tight but they aren't. Of course they don't last as long as a leather slipper and because she dances for 4-6 hours, 6 days a week and about a third of those hours are in slippers versus point shoes. She goes through about a pair every two months. So I couldn't quite give them a excellent rating for durability but they are very good. I love these shoes! They fit very large and I had to exchange to get a pair a full size smaller. No big deal and worth the wait! I used to love these shoe and have worn this type for years. They fit well, looked good, and lasted a long time. But somehow things have changed. The last pair I got started to tear on the bottom of my foot within just a few weeks of use. Luckily it didn't interfere with my dancing, and I thought I must have just gotten a bad pair. So i reordered them, but this time the heel has so much extra fabric it looks utterly ridiculous!! I have tried getting a smaller size, but it looks just the same. What happened? I am so disappointed. Will return these an shop for a different brand. I love Bloch and have worn their ballet slippers for teaching for many years. Although this shoe is convenient and comfortable, it continues to fall apart within weeks. All my pairs have several tears vertically from the elastic that replaced the drawstring. This has been my "go to" shoe for a couple of years. I love the fit, look, comfort, pre-sewn elastics but......I have noticed a substantial decline in workmanship quality. The shoes split on the underside arch seam AND across the top of the foot vertically after only 2 weeks use. Usually the toe gives out after reasonable wear, so this is all a change. What gives? I see others have noted the same issue. Discount Dance ought to address this directly with Bloch. Hello! Thank you for sharing your experience with these shoes. We will address the issue with the manufacturer and make them aware of this incident. One of our Customer Service representatives will contact you to rectify the situation. After going through about four different pairs of slippers of various styles I at last came to this one. The convenience of not needing a drawstring or having to sew on the elastics alone should be enough to make you want to try these. In my case it was the best fit i have thus far experienced. They conform very snugly to the arch which is helpful for those of us who have trouble making an obvious curve when pointing, and the elastics around the edge prevent shifting. I still had to take in some excess fabric in the toe (since most shoes are not made with an egyptian foot in mind) but other than that perfect fit. For reference i have short, wide, deeply tapered "egyptian" style feet. These shoes are great! I'm usually a 8.5 in street shoes and I got a 6.5 and it fits perfectly. I absolutely love the elastic instead of drawstrings it makes everything easier. I've had these shoes for about 8 months and they don't have any tears or anything like that. My only complaint would be the heel of the shoe is kind of bunchy but its not that big of a deal. These are pretty good pair of shoes overall. I definitely recommend them! This is a good comfortable shoe that lasts a long time. The only reason I'm not giving it 5 stars is for the way it fits in the heel. There is too much fabric where you can almost pinch an inch at the base of the heel. I've tried smaller sizes, different widths,but nothing gets rid of it. I also tried shrinking them in the dryer which helped. Other than that, super comfortable and otherwise look nice. These were the first pair of ballet slippers I bought (for classes, but then the studio closed, so I just do at-home workouts). I have weird feet - they are on the wide side with really high instep and fairly high arch and I have long toes (hammertoe-like in that in a totally relaxed position, the first knuckle from the bottom is bent. My normal sandal size is a 7 or 7.5 and wide if it's an option. My normal non-sandal size is a 7.5W-8. These are comfortable in some respects - there is some bunching up around the toes and especially at the heel, but that doesn't bother me. What makes them unwearable for me is the elastic - what is supposed to make the comfortable - it just digs into the tops of my feet at the front and the elastic criss-cross strap is waaay too tight across my instep to be comfortable for more than a few minutes. I would say if you have a foot similar to mine, you'd probably be best off trying a different one. But if you don't have my foot issues, then these would be really comfortable. They do make the arches look super high! Oh, I got a size 6C in these. I wear a size 9 shoe, I saw that the shoe runs small so I bought a size 7 and they were HUGE! I then bought a size 6 and they are still too big! they're ok enough to wear to rehearsal but they look funny so I'd never wear them to perform. I need a 5 or 5.5. I love the elastic around the top to take pressure off where a regular tied slipper pinches my heel. If you get the right size it's worth it but watch out. I've been using Bloch split-sole leather shoes since I started dancing 15 years ago but have wanted to try canvas. I went 3 sizes smaller and picked the same width as my leather shoes. These are a perfect fit, but I can say they run much narrower than the leather shoes. My only complaint is that the heels are a cut bit low and there's not much padding on the ball of the foot. Otherwise, a beautiful, soft shoe that makes my feet look great. My daughter wears a size 5. The 5 was too big so we sent them back and ordered a 4. Then the 4 was still too big. Now I don't know if I should order a 3 or 3.5. These shoes are great! They are super comfortable, fit well, and make your feet look amazing, almost as if you were bare foot. They were down at the normal speed of most canvas shoes but are so worth it I definitely recommend. Will be buying again once mine wear out!!! Split at seam after one week! We usually use the Elastosplit, but tried this because the Elastosplit was on back order. My daughter wore it ONE WEEK and it split at the seam on the bottom. There was no way to repair it. Something is wrong with this style. We usually love Bloch shoes. I bought these because a friend recommended them. However, when I finally received my order, I was very disappointed. I followed the sizing directions (which were not helpful at all) and they were way too big. They made my foot look extra long, were baggy around my toes and overall not flattering. With my ballet tights, the color (pink) was awful and interrupted my line. As I said, a friend recommended them to me so I am sure the shoe works for some people, but I would strongly recommended trying them off before ordering them (if possible). If you have to order them online, order small, at least 3 sizes!! The toe and heel when I first purchased these shoes seemed a little weird and big. But after wearing them for a few classes they fit like a glove. They're super flattering, and they look like you're almost not wearing shoes. It's now almost two years later and these shoes are still going strong! They have a bit of wear on the toes, but that's to be expected with any canvas shoes. I will be re-purchasing these shoes after they are completely worn out. Runs a bit large because it's made of canvas, but if you figure out your correct size, it's great! I'm used to a tight-fitting ballet shoe so for me 3-1/2 sizes smaller and 1 size wider than my street shoe was the ticket. Canvas doesn't last as long as leather but the comfort from 1st putting them on is lovely. No breaking-in these babies! And the elastic all around the edges makes for a nice, snug feel. Have had 4 pairs, will have many more [as long as they keep making them!]. I have always worn leather slippers because my studio required them and finally I am allowed to wear canvas shoes to class so these are my first pair of canvas ones! I am usually a size 8 in street shoes and have a normal/ slightly broad foot (i wear normal width shoes). I used the size chart and decided to order a size 6c ( B is a narrow foot, C is normal feet, and D is a wide foot). When I tried them on the width was perfect and they were super comfortable however they were slightly too large in the heel. So I'm going to exchange them for a 5.5c. I love the elastic band instead of a normal drawstring, it hugs my foot better and shows off the arches that I don't have ! I haven't danced in them yet but I definitely love them so far! Looked like an awesome shoe, but I just dont think its the right fit. My foot is wide but it was still snug on the side, and did run big in the toe and heel. I would have exchange it but the price for exchanges are ridiculous so I shall make them work. I got this product fairly quick, and when it came in the mail I was so exited. My street shoe size varies from an 8.5 to a 9, and I have a wider than average foot, but not really enough to be called wide, so I got 6.5C. When I tried on the shoe, it gapped on the heel, and was too long in the toe area. I took it to my ballet instructor, for her ideas on how it fits, and she said that they were on the bigger side, and to order a half size down, but with the same width, so I followed her instructions. When I got the correct size, they fit like a glove, and all of my dance friends are jealous, since they had to cut their drawstrings, and tuck them in. Overall, I love this shoe, itreally makes my arch look great, since I don't have the best arch. Comfortable shoe, not the right fit. Sadly, my long and very narrow feet made this shoe impossible for me to wear, despite getting the narrowest width, and I had to return them. It was snug in the arch, but baggy on the sides of the toes and heel--despite the fact that length wise they were a bit short. I liked the elastic instead of a drawstring, because those tend to put too much pressure on my achilles. Friends of mine have worn these and loved them, and they've had no problems with durability or size; but alas the shoe is not for me. I really did not enjoy these pair of ballet slippers. They run fairy large on my daughters feet. I really think that you should order 2 sizes smaller to your regular street size. Overall I don't think I would recemend this to any of my friends. I love these ballet flats! They feel so light on my feet and form to my arches so well. Before these, I danced in Sansha Pros and now I don't think I could ever go back. I normally wear a B width in Bloch though and I had to get a C width in these shoes. My friend also had the same issue. I think they run a little narrow. My daughter is an advanced dancer and is in the studio approximately 8-10 hours a week for classes and another 10 for rehearsals when they are in the middle of a season. Granted about half of that time is probably on pointe, but she goes through these shoes which she loves and states look and feel amazing in about 2 months. Im a size 9 in street shoes, with a narrow foot and i ordered size 7 with the width D. They work perfectly! The shoes make my arch look great and the split sole has a lot of cushioning. The elastic band makes them very comfortable. My girls really love this ballet shoe, and I love it because I don't have to sew the straps in! We have tried leather ballet shoes as well but these provide the most comfort for sure. They both wear a size 8 1/2 street shoe and the size 6 in these fit well! So I would say go at least 2 1/2 sizes down from the street shoe size. My one daughter has an average to narrow foot and she goes with the C width and my other has a somewhat wide flat foot and she likes the D width. If they dance 2-3 days a week they will wear out pretty quick but we can usually make them last one full season. Overall great shoe especially for the value! I love this ballet slippers!! I wear a size 9-91/2 show and I followed the sizing guide and got a 7 1/2 and they fit perfectly. Well, as perfect as flats can fit for me. I have a long big toe and my other toes are dramatically shorter, but these shoes are my favorite. It helps me that there isn't a drawstring because having the clump of the knot of a drawstring pressed against my foot eventually bruises. I bought this in a size 6.5C for my size 8 wide feet. It is very comfortable, and very durable. My first pair has still not broken after a year of wear. I recently bought another pair because they are just so comfortable, and they show off your arch well. The only reason I did not give this product 5 stars is that it is a little baggy in the heel and toes, so some people might not prefer the style, though I don't mind. Great ballet shoe overall! This is my first try at canvas shoes and I love them! These are so light weight and comfortable and I loved not having to sew in the elastics myself. I also enjoy the stretch of these so that there is no need for a draw string. I read other reviews of this shoe that mentioned they didn't get the shape they wanted with this shoe because they felt it was too bulky. It might be that I got the perfect fit, but I'm not having these issues at all. Nice quality, but not the right fit. This shoe has many pros: no-sew elastics and comfortable, however there are cons to counter these two benefits. While the shoe itself is good quality, it is not as flattering as other canvas ballet shoes I have tried. The material seems to be very baggy at the heel and in the toe area. There is no adjustable drawstring, which I believe contributes to the bagginess at the heel end of the shoe. I am a size 9 in women's street shoes and ordered a 7B. Length-wise the shoe fits just fine. These are comfy and affordable. They fit exactly according to the size chart by which I ordered. The only thing that would make them better is if I could wear them without tights. (They are a little sticky on the inside by the seam.) But since most dance schools require tights anyway, that is really not a big deal. And I love the fact that there is no drawstring. I can never get those to stay tied! The overall feel is rather "baggy", a lot of material that is not exactly thick but loose. Performance wise, the large padding at the ball of the foot does make for better balance for beginners, but as the working foot the padd tends to shift forward and make the toes appear less pointed. It does not form the sleek/advanced foot very well, there is just a lot of loose material and does not show off the shape of the foot. The shape of the leading edge forms okay for both tapered and squared off toes. Though it does seem to favor tapered forefoot with the 2nd toe longer. For beginners this may be a good slipper, the elastics are already sewn and no drawstrings. The elastic that replaces the drawstring is not overly burdonsome but it rides rather low. I liked these shoes, but I didn't buy them again. The don't look as odd as they do in the picture. Comfy, but no more so to warrant another purchase. I got them because I thought they'd be really nice for my wide feet, but it wasn't a drastic difference. These are very durable, I thought they would be great because you don't have to sew any elastics or worry about the drawstrings but they make my arches look unattractive. These lasted me about 6 or 7 months. I just got these shoes in the mail and they are really comfy! I wear sizes 7 1/2 or 8 so I got the size 5.5. They are a little baggy at the heel but that normally happens to me. They are perfect! I can't wait to wear them in ballet class today! Everyone in my studio has switched to this shoe. It is so much better than what we used previously which was sansha split sole canvas. Thlis one is like wearing a sock with split soles. They hug and conform to the foot with no wrinkles.It shows off your beautiful arch and pointe. It will make bad arches and pointes look better. They are flattering to ANY foot. IF they look ugly then they are probably too big even though you think they fit. They need to be SNUG with no heel room. I don't mean tightly squeezing. I mean snug like a sock. Order at least 2.5 sizes smaller than street. Even that is too big for me. I wear 3 sizes smaller. I am an 8 so I wear a 5 nicely. I have worn these shoes for two years and they have been very durable, pretty and long lasting. Comfortable as they are, they don't mold to your foot and that makes them not very flattering. There is a huge bump on my heel and the toes are baggy. I will probably try a different pair of shoes next time. If they fit you they are a good buy but they're just not for me. First of all the product looks nothing like the picture. It covers an oddly large amount of the front of the foot and moreover is saggy at the toes and heel but too tight on the elastic (and I have thin feet). It does not highlight the arch well at all and feels as if there is something in the shoe that you're stepping on at all times, very distracting. I would not recommend this product. I don't see how anyone would have a problem with these shoes. Love this shoe! Their really comfy and make your feet look so pretty! They're not baggy around my feet like other shoes I've worn in the past, and the elastics come sewn on!! I mean, what more could you ask for? Also, no strings to worry about! These are my favorite ballet shoes! They are wider in the ball of the foot which is great for people with wider feet. Also, the pre-sewn elastic is comfortable! They run true to size. If you have found other types of ballet slippers uncomfortable, I recommend giving these a try. I love the flat elastic (which seems to put less pressure on the foot than a drawstring), the wider metatarsal pad (which means there are no seams under your foot when you are on releve), and the roomy toe box. As for size, I wear an 8.5 M in most street shoes, and the 6.0 C in these is just right. Everyone's feet are a little different, but these are perfect for me. My favorite ballet shoes by far, hugging my arch nicely and without the annoying drawstrings on other ballet shoes. Mine were tight the first couple classes, but once the broke in, I fell in love. They are a tad big in the toe, but with feet being slightly different sizes, what can you really do? ;) I had my first pair for about 3-4 months before they ripped in the arch. amazing fit with the right size! I have never had ballet shoes that formed perfectly to my feet before, I have very narrow small feet with a bit of a curve (naturally like this) and I've never felt so comfortable in flat shoes before. The canvas that usually require being tied and worn under the foot (or alternatively sewn to the sides) have an uncomfortable padding at each of the split soles of the shoe. I just ordered these in a flesh color (since reviews said only really tan people order that color) and I'm of filipina descent so my skin is naturally tan but they did not work, the color did not compliment my skin tone so I returned them and just reordered these in pink. I'm a size 5.5 in my street shoes and ordered a 3.5B in these and they fit wonderfully! Unlike many other shoes, these really show off the arch in your feet (and I don't have a super arched foot either) so get these already! When I have the money I'll probably just order a couple pairs so I won't have to worry about getting more pairs in the future. I dance and teach 4-5 days a week and it's almost like dancing barefoot or in very thin socks - its that lightweight! The elastics come pre-sewn so that's another pro to these. Can't really think of any cons to these specific shoes. I love these shoes! The fit is fantastic! No more crunched toes. I finally found a shoe that gives my toes room to point and flex uninhibited while still maintaining a snug, secure fit around the foot. While it is true that the elastic edges of the shoe are slightly less attractive than traditional drawstring slippers, the comfort and fit are most definitely worth it. If you want comfy shoes, look no further. I would say they run slightly small but I also like my shoes with a tiny bit of toe room. I wear a street size 71/2 and ordered a 51/2 and they fit perfectly. Tight around the foot but still give my toes room without crunching. I'm a belly dancer instructor, and these shoes are really comfortable, I teach 3 hours on a row 4 times a day and I didn't have to brake them. They run large, I'm normally wear 5.5 street shoes, and these are only 4, regular wide (C). You can get them for narrow, normal and wide feet. I read some reviews and some people are complaining that they don't look stylish, and they do if you get your right size, I can see how they might look if you get a larger size. It wasn't my case. They recommend to get 2 sizes down, but I wasn't that comfortable, so instead of getting 3.5 I got 4 and they work fine for me, maybe next time I might try 3.5 but I'm not sure. I wore these shoes for a year and they worked great! they are really comfortable but they didnt make my feet look good and were a little baggy even though I have big feet. If you have narrow feet I would not recommend them but if you have wide feet they would work great! Hope this helps! I was first tempted to purchase these shoes after suffering a tear in my achilles. I am so glad I did. These are without a doubt, the most comfortable pair of ballet shoes I have ever owned. With the absense of the draw string it puts no extra pressure on your achilles and gives your a foot a beautifully clean finish. I have sinced re-ordered these numerous times and also purchased them for my 7 year old daughter. Great Ballet Slipper! I decided to try these because a lot of our company dancers have started using them. I love the elastic border instead of the drawstring AND I LOVE the fact that the straps are ALREADY sewn on! Talk about "Sew" easy! Very comfortable and molds to the foot's shape very well, even though the canvas is the non-stretch type. This surprised me because I'd been using the stretch canvas Merlet Scarlett's for years to get the smooth fit, but then they changed their vamp height and drawstring casing and I had to go on a search for a new shoe. I ordered 4 different brands - 3 stretch canvas types and these, and these won hands down. One tip definitely order smaller than you think. I wear 6.5M street shoes and based on the Bloch instructions I ordered 2 sizes down and got a 4.5M, but these were still an inch too big at the heel. I returned these and got 3 more pairs in smaller sizes to see what fit. The size 3.5M fits perfectly. Try this shoe, I think you'll love it! I have been using these shoes for the last couple years. I've gone through quite a few pairs of them and keep coming back to order the exact same shoe every time. Since I teach and dance 5 days a week, I usually run through a pair of shoes quickly. These are not much better than any other canvas shoe on durability, but they are definitely the most comfortable ballet shoes I've ever worn. Even some of my adult and teen students have switched over to them. I usually wear a 4.5B in bloch, but a size 5C in this shoe gives me a little bit more room and seems like a better fit. The first thing I love about this shoe is that there is no draw string around the crown of the foot. It's all elastic which gives a great deal of comfort. You don't nee to tuck the access string under the front of the shoe which can sometimes feel uncomfortable on the knuckle of the toes. I wear a 7-7.5 street shoe and I ordered a size 5...I think I could've even gone up to a 5.5 on these. This shoe almost just feels like you have a foodie sock on. It hugs nicely, doesn't move around, and is very light. I Love this shoe. These shoes are amazingly comfortable. I've only worn them once so far, but already know these are going to be one of my favorites for comfort. The shoes feel almost like having nothing at all on my feet- the wide and flat forefoot outersole is very easy to turn on, and the shoe conforms pretty well to my foot, even though I have tapered Greek toes. The heel was bunching on me, but I washed the slippers, and let them almost dry in the drier- and wore them the rest of the day inside- the bagginess in the heel is diminished. The elastic on the Achilles is much more comfortable than shoes with a drawstring, although the elastic is a bit tight- but not annoyingly so. I do not think these are pretty shoes- they look like house slippers on me- but I will wear them for the comfort factor. The pink color isn't very light and doesn't match any of my ballet pink tights at all- the color is more a beige pink. I'm not sure how durable they will be- the weave structure doesn't look as tight as some of my other canvas shoes (like the Grisko Ultimate canvas- my favorite shoe- or the Mirella Balloon canvas), but for the price, I don't mind if they wear out quickly. Finally, for size comparison, I normally wear a size 6 medium in dress shoes, and the 4B fits me well. Overall a good shoe, and would recommend! Over the years, I have tried multiple different ballet shoes and brands. I got so frustrated with my string elastic that I would have to tie that I pulled it completely out during a Christmas show I was performing at! Oops! I went searching for a good pair of shoes and got exactly what I wanted in these. These shoes compliment my arch very nicely (I have very high arches) and are very comfort able to dance in. I prefer them over jazz shoes and FootUndeez in both Lyrical and Jazz class. The only problem I have had is when I first broke them in, the elastic was tight on my heel and where the elastic that crosses over my foot meets the shoe was a little bulgy at first. After they broke in, though, they were fine. I would also have trouble with the lining coming apart in other shoes and, so far, that hasn't happened. I wear a 7 street shoe and ordered a 5.5 B. There's a tiny bit of room above my toes, but nothing too dramatic. Overall, these are great shoes and I highly recommend them. Worst shoes I've ever worn, personally. I wanted to like them since I love canvas shoes and I hate sewing and drawstrings and thought these should be perfect. The shoes have an odd fit, and will not stay in place. They bunch and shift and twist constantly. Trying to turn in them is a joke. 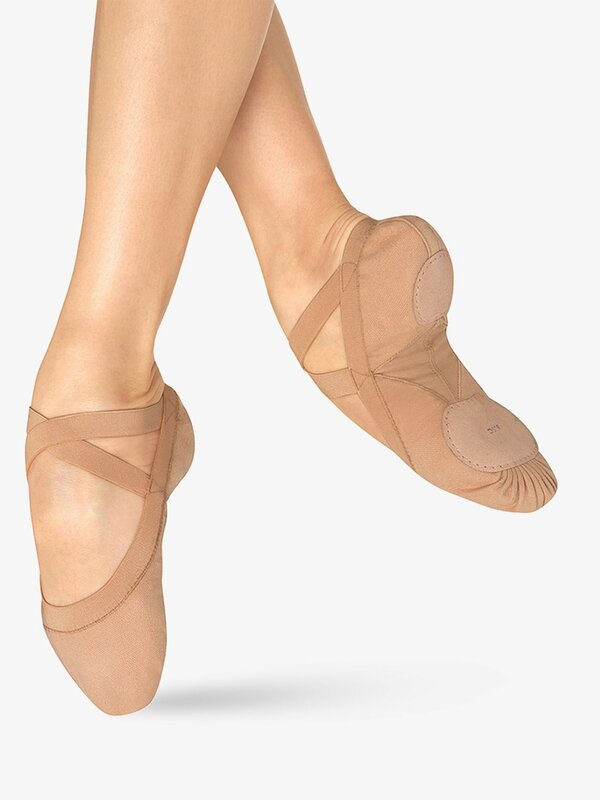 I wear a lot of Bloch styles and usually they fit me well, but this style and my feet are just not compatible. I have never hated a pair of shoes more than these. I hate sewing elastics so I love that these come pre-sewn. I wear a street size 10B and the 8C fits me like a glove. I found that the B was too snug around the elastic so if that's your concern, go with width C. SO comfortable! Fit beautifully on my arch. I've worn these for 2-6 classes per week for a year and I finally had a blowout in each one at my big toe (yes, I alternated R and L.) But that's a long time for a canvas shoe to last! I would just pop them in the washer every once in awhile and air dry. I like the flesh tone as I'm not a pink tights/pink shoe kind of girl. Love these!!! I bought these in flesh and they match my skin tone so well! They also make my feet look amazing with their snug, elastic fit and overall, my line is just so much nicer with these shoes. They're really comfortable too. I wear them even to jazz or contemporary practice, not just during ballet. They made my feet look so nice a friend bought a pair as well and she loves them too. Highly recommend these! This shoe was alright. The flat elastic was nice during splits because there wasn't a knot to dig in like traditional drawstring slippers. However the elastic was too tight, it dug into my heel. I have more flat feet and these shoes gave my friends and I all such bad cramps during temps-leves. The pre-sewn elastics were also too tight. They help up decently until I performed on stage in them. I've written a review for these already but it was right when I got them. Now, I've been using them since about January. They did break in and feel pretty good most of the time. Sometimes my feet are a little sore after wearing them but it's not a big deal. It's worth it because they're just so much better than regular ballet shoes with a drawstring. For the price, I'll definitely order more in the future. Maybe I'll go wider next time though because they are a little tight around my arch. They are very durable though. I've worn them for performances outside a few times even and there are a couple holes now but only through the outer layer so they are still very usable. I wear them in dance all the time, not just ballet. I prefer them over jazz shoes. They have a good amount of grip, and are not slippery like leather shoes. I wear a size 7/7.5 street shoe, have wide feet and ordered the shoes in a 5B. These have been the worst ballet shoes I've ever owned. I saw a girl at the summer intensive I attended this past summer with these shoes on and I had fallen in love with how they looked so I thought I would give them a try. I love the fact that the shoes have elastic across the top rather than having to adjust the string, but even after using the shoes for 2 weeks, they are still uncomfortable. The elastic binding squeezes my feet and I usually fit a size 5 in Bloch ballet shoes and the length of these shoes are rather longer than expected so the fabric at the heel sticks out making my heels look really boxed. The elastic straps are tight as well even after re-sewing them. I'm really disappointed with the shoe, not only are they uncomfortable overall, they don't look great on my feet. I'm not sure if its just because I have wide feet, but I do not recommend getting these if you do. I love these shoes. I bought them about 4 years ago. Not only are they durable, but they also fit so nicely. They do not bag and they are perfect for wide feet. With the elastic already sewn in and the price as good as it is, You can't beat these for being your go to pair of ballet shoes. I can't get enough of them. These slippers are alright, I ordered a couple sizes to try and originally was very happy with the size I chose that I felt fit the best. They didn't do much to accentuate my high arch and the fabric at the front of the shoe bags when I point, as do my other pair of Bloch slippers. They have pretty much no support and the color is a little strange (sort of a light strawberry pink vs. muted pastel pink). All in all, these slippers would be alright for a casual dancer but a serious dancer would most likely want a better fitting, more attractive, and more supportive shoe. I'm always looking for a good pair of canvas ballet shoes, so I bought these about a year ago after seeing the reviews. These shoes are very comfortable and well-sewn. They are also flatter your arches very nicely. I have average-sized feet, but when I got them the criss-cross elastic was a little snug for my taste. You may have to resew the elastic, but other than that this is a great shoe! They are very durable; I wore them often and outgrew them before they wore out. Overall fantastic quality and good price. Overall, these shoes are wonderful! No elastics to worry about or get stuck in your toes! These shoes automatically adjust to your foot's shape and contour. I really loove this slippers! the elastics hug your feet they are really great and confortable love them! I wear 7.5 in street shoe and I order 5.5 C and fits me great! I've been wearing these for 3 years now and I love. Yes, they are canvas so durability isn't going to be incredible, but they fit my feet beautifully and hug the arch better than any other shoe I've ever tried. I haven't had any problems with the heel slipping. I've washed mine a few times and they still hold up and fit well. I've gone through 4 pairs in 3 years dancing just about every day, but I do switch the feet and pairs out occasionally. They aren't for everyone though. My friends with flatter feet do not find them as comfortable. I normally wear a 9 in street shoes and wear a 6.5 C in these. I've tried MANY brands of ballet flats, these are by far the best. I LOVE the elastic surround, it cups your foot without being constrictive and flatters your arch. I wear a size 8.5 to 9 and in these shoes I wear a 6.5 M... I have a narrow-ish foot, so the medium is fine, and plenty of room. I love that they come pre-sewn, so you just put them on and go... I wore these shoes for a year, and am just now needing to replace them, due to holes in the toes. I actually switched the feet (so the holes were now on the side) and wore them even longer. BEST shoes ever! I love these ballet shoes! But they run really big. I wear a size 6-7 and I got a size 3 1/2. I got them last summer and they now have a hole in them. I like how they come sewn so I don't have to sew them myself! I wear shoes sized 9, 10, and 11, (depending on the brand) though I usually consider myself to have size 10.5 feet. I wear narrow (A) shoes when I can get them, but usually survive in the normal width. I got size 8 in these ballet shoes, and if I had it to do over, I probably would have gotten 7.5. The 8s fit fine, they are just not snug in the front. That said, they are comfy and quick to put on and take off. I've been wearing them for about a month and love them. I haven't decided if these fit right yet. They were a little tight in some areas at first but tights keep the straps from digging in. I wore them around the house for a while to get a better feel for them and after a while my feet felt sore, as if I had been running or something. I'm hoping they just need to be broken in a little because I love these shoes. If you have pretty wide feet, maybe you should order a D because I could probably use a little more room. I absolutely love these shoes!! They are so comfortable, and I love dancing in them. Not having to deal with the elastic drawstring is great:) The price was great too! So far this is a good shoe. I started taking belly dance class for exercise and needed something to be able to do turns as my feet stick to the floor. I took the advice of one poster. I wear a 9 wide most times in shoes. I ordered a 7C and it fits fine. Just have to get used to the heel, again as I�m not used to "shoes" like this. So far so good, but I only wear them once a week and have had them a month. Good price also. I have continually come back and bought this show for years now. Its suggests to buy a couple sizes smaller, definitely do, but even if you get a 1/2 too big its no problem, just keep in mind if you get them right or tight they'll stretch out. These shoes also last a long time. I love the price and the few times when I couldn't order these online and had to go to the store I could not stand dancing without them and had to order them the next day. I love this shoe! I wear a size 7.5 street shoe and ordered the 4.5 (same size I wear in my Bloch serenade pointe shoes) and they fit perfectly! I see some other people are saying the elastic is too tight, but I just got the "D" width and that gave some more room on top. They make my arch look great and are so comfortable! This shoe was recommended to me by a friend who thought it would look good on my feet. I have wide feet and I very much like the way it looks on them. The shoe cut off right where my pinky toe is! The elastic scoops way low... or my toes goes too high! I don't like them :( They look really cool though! I love love love these shoes! I was a little nervous about ordering them online because of sizing but they fit great. I have a size 6 1/2 foot so I ordered a 4 1/2 C. They are a tad big so a 4C would have been better but I am in love with the shoe. No annoying drawstrings and the elastic is already sewn for you. Definitely the best shoes I've ever had. They are super comfy and really show off your arch. The material is really flexible and doesn't squish your feet at all. The shoes are great! They really show off the arch and they are really easy to turn in. I bought these in August and I wear these 6 days a week to dance and teach and they are now just getting holes(it is December 1st). Loooovely!!! I fell in love with this slipper. I just wear them today, and everything felt so nice. They make your arch look really nice. For the price, you get a nice and beautiful shoe. Go with 2 sizes smaller, unless you have very narrow feet. I'm a 7, and I'm wearing a 5C in these Blochs. This slipper is, hands down the most comfortable ballet slipper I have ever worn! First off, unlike in the picture, the elastic is the same color as the canvas, and the color is much lighter - your standard ballet pink. The fabric is very soft and "fluffy" and does pick up some lint/debris, but I don't think it gets dirtier faster than any other slipper I have. The elastic keeps the shoe molded to your foot and now I never feel like my shoe could twist off. No more digging in my heel! The arch insert hugs the arch very nicely. The padding is perfectly placed just where you need it. Only downside is that the bottom sole is suede, so turns take some getting used to if you've never had that before. But the suede does wear down and the problem goes away after a few classes. And the price! For the amount of money, you have to give these a try. These shoes run slightly big; I usually wear a 7D in Bloch shoes, and I wear a 6C in these. I really like the elastic that replaces the drawstring. It helps flatter the arch and "hug" the shoe to the foot. The sides of the shoe are cut slightly lower than I would like, and the canvas is sort of a little bit "fluffy" of felt-ish so floor dirt sticks to these shoes really badly. All around, they are a comfortable shoe. Is 8 the largest size these shoes come in? My daughter usually wears a size 9has a wide foot. Unfortunately Bloch is only providing up to size 8 in this item as of right now. What does the B,C,D stand forhow do those letters affect the size of the shoe? Those stand for the width of the shoe. is the D for a wider foot? Yes, the D is the widest length. Hello! Thank you for contacting us. The size we recommend is the size 8.0 or 7.5 for extra growing room. can you give me more information on how the Bloch shoe sizing converts? Hello! Thank you for contacting us. The recommended size is a size 4.0 or 4.5 for wider feet. thanks, im size 7.5 dont understand wath does it mean thE letters B,C,D. Hello, Thank you for contacting us. The letters are the narrow(B), medium(C) and wide(D). Is this canvas stretchy like in the Bloch Synchrony ballet flats? I have a pair of those, but I love the idea of the elastic insert like these have. Also how does the rest of the shoe differ from the Synchrony? This shoe will be difficult to fit for your daughter. We would first have to convert to her adult size, which would be a 3.0 or 3.5. From there, you have to follow the size suggestion for adults which is to order 2 to 3 sizes smaller. The smallest size this shoe comes in is an adult 2.0, so it may be a half to full size too large for her. What is the pink color like? I've owned pink leather Bloch slippers before and the pink color is a bit too dark. Do these match tights? The pink on this slipper is a bit darker than your average pink ballet slipper. It should match well with Bloch brand tights in Ballet Pink. What are the measurements for a B, C, and D? Do they define these by width of the foot in inches, centimeters, other? Just wondering so that I can measure and get a proper fit. What color (Flesh or Pink) is shown in the product photo? The shoe is pictured in the pink color. Which color (Flesh or Pink) is shown in the product picture? The pink color is the shoe pictured. What size is equivalent to Bloch neo jazz shoe in 5.0? 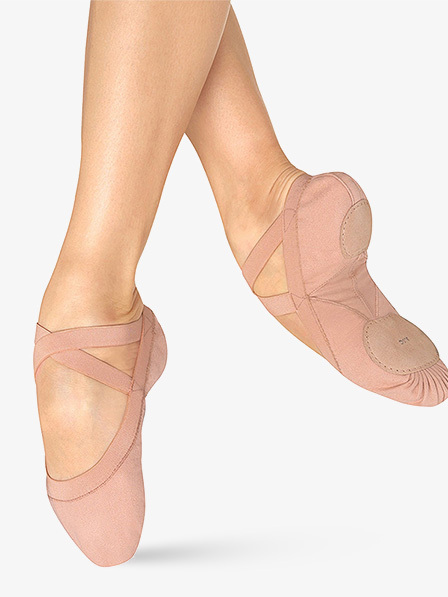 In Sansha ballet slippers I wear a 9 M/N what size should I order for the "Pro Elastic"by Bloch? should I go a size smaller than my street shoe size or keep the same size?